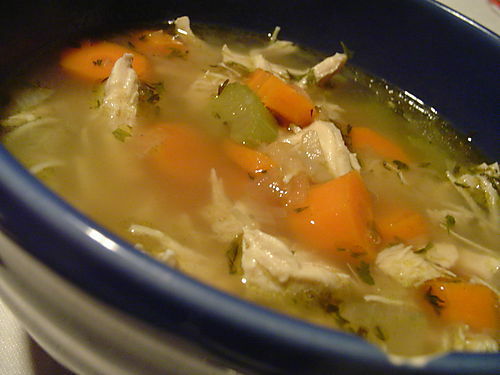 This is a great chicken noodle soup recipe for you to try. It is of course very simple to make and very tasty! Boil the chicken in the water and simmer for about 15 minutes. Add the onion, pepper and salt and the bay leaf, simmer for another 30 minutes. Remove the chicken and cut into small chunks. Add the chicken back to the water along with the carrots and celery. Bring ot the boil and then simmer for another 15 minutes. Add the noodles and cook for another 10 minutes. Remove the bayleaf and serve.